Pari, as everyone fondly calls her is a little bundle of joy born to Vishnu and Lalita. She was their sixth child and was born extremely underweight. At just 1.8 kilograms, she was indeed a high-risk baby. Adding to the family woes, Lalita soon became weak and unable to breastfeed the newborn. Pari’s fast deteriorating condition was noticed when she was first weighed by project staff in January 2014. Sulochana Thapar Foundation’s project for reducing malnutrition in children is implemented in three states – Madhya Pradesh, Odisha and Rajasthan. 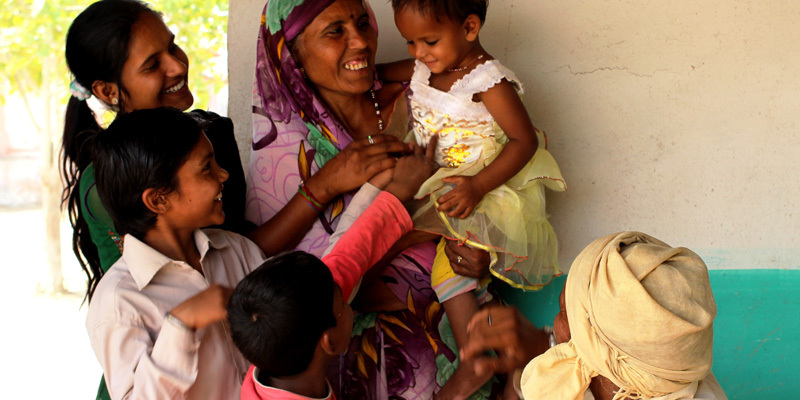 Pari, who lived in Sheopur, Madhya Pradesh was covered by the project immediately after her first weighing. Ram Naresh, the field coordinator from the project, kept a close watch on Pari’s condition. He made frequent visits to the family and counseled both Vishnu and Lalita on the nutritional status of the child and on ways to improve the same. He weighed Pari regularly, meticulously kept records of his observations and offered advice and support to Vishnu and Lalita. He counseled them on supplementary feeding, immunization, hygiene and sanitation. Supporting Ram Naresh was Shakuntala, the local Aanganwadi Worker, who took the parents into confidence and provided counseling and support even when the coordinator was away. She provided home based counseling, weighing and regular advice on nutritional status of the child. Pari is now two years old and she has successfully made the transition from being severely malnourished to a normal nutrition grade baby. This was no small achievement and did not come overnight. It took more than eight months for Pari to make the transition from severe to moderate nutrition grade, and another six months to make the normal grade. “We were lucky to have Ram bhaiyya and Shakuntaladidi coming over”, says Lalita. “Our daughter wouldn’t be the healthy and happy child she is today without them.” Pari was indeed in good hands.